“Can you read that lowest line for me?” My eye doctor had just adjusted the lens correction for my new contact prescription. I could read every one. Prescription updated. Vision check success. My optometrist has each and every necessary tool to look into my eyes and check them. Lights. Some red. Som white. Lenses. Drops. All this specialized equipment to give me a vision check. That recent appointment has had me thinking, “What can I see spiritually?” And as I did, I realized, the One who created our eyes has placed tools before us to check our spiritual vision. 2 And after six days Jesus took with him Peter and James and John, and led them up a high mountain by themselves. And he was transfigured before them, 3 and his clothes became radiant, intensely white, as no one[a] on earth could bleach them. 4 And there appeared to them Elijah with Moses, and they were talking with Jesus. 5 And Peter said to Jesus, “Rabbi, it is good that we are here. Let us make three tents, one for you and one for Moses and one for Elijah.” 6 For he did not know what to say, for they were terrified. 7 And a cloud overshadowed them, and a voice came out of the cloud, “This is my beloved Son; listen to him.” 8 And suddenly, looking around, they no longer saw anyone with them but Jesus only. These verses are overflowing with truth for us, but for our purposes here, I only want to highlight two key tools God uses to give us spiritual vision check. First, he sometimes breaks our routine so we see Jesus more clearly. Jesus took his three closest disciples with him on the mountain to include them in reveal they needed to see. This Transfiguration was all about Jesus’ identity. His power. His glory. His preeminence. His authority. His lordship. His might. Are You in an unusual place? Is life a bit unsettled now? Have some unexpected trials come your way? Is your routine out of kilter? Look. Pay attention. God’s quite possibly trying to show you a fresh glimpse of Jesus. Second, when you do begin to see what God’s doing around you, don’t miss the Savior for the salve. Don’t mistake the miracle for the Miracle worker. Don’t be distracted by the grand expression of God’s involvement in your life that you miss God altogether. Standing right there. In front of you. Back to the eye doc. After I read each of those letters, the thought never crossed my mind to thank the large, metal lens contraption she had just removed from in front of my face. I did not—even one time—consider thanking the bright, white light she had just used to peer into my eyes only a minute before. Nor did I contemplate thanking the letters on the wall for being bright and visible. But I did thank her. The doc. The expert who used each tool to help me see each letter deserved my appreciation. It’s not the tools we thank. It’s the Doc. How’s your vision? Do you need a eye check? What can you see? When you finish the exam, remember, it matters most if you see Jesus. And when you do, thank him for it. 500 years ago, on October 31, 1517, on All Saints Eve, Martin Luther posted his 95 Theses to the door of the Wittenberg Castle Church. I rather doubt he or anyone else would have imagined that the nearly imperceptible quill scratches and nail strikes that fateful day would continue to reverberate so loudly five centuries later. His initial short term hopes that the Roman Catholic Church would reject the horrendous practice of selling indulgences were soon dashed by a Papal Bull, trial in Germany, and excommunication from Roman Catholicism. Yet even excommunication couldn’t silence the resounding echo that Luther and the other reformers sounded. As these early, tenuous years gave way to greater theological courage and precision, five solas — Scripture alone, faith alone, grace alone, Christ alone, to the glory of God alone —would shake generations of Christians loose from the chains of Roman Catholic dogma. Ironically, what Luther first intended to be corrective and cleansing to Roman Catholicism in part helped spur the greatest segregating of denominationalism history has ever seen. Out from under the hovering religious and political control of the RCC, varieties of theological affiliations and Christian practices grew and spread. 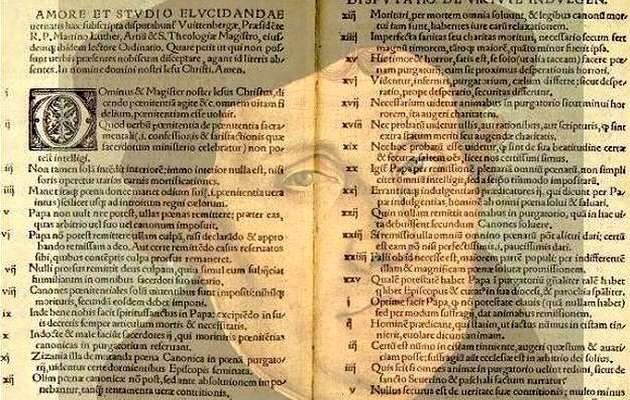 As a professor of theology at a Baptist College, I have studied, observed, and benefited from many tremendous and even some forlorn ramifications of Luther’s noble efforts in 1517 and beyond. Too often, the days since the 95 Theses have been marked by division in Christ’s church. Too often, Lutherans and Presbyterians find themselves against Baptists on infant baptism or the table. Too often, Pentecostals reject the passionlessness of their parent denomination of Methodism. Even non-denominationalism casts itself off from much of the clannish nature of mainline Protestants, conservative Southern Baptists, or Spirit-pursuing Pentecostals. To be sure, doctrinal differences like those above are significant. And they should cause each of us from our respective convictions to firmly hold to them without compromise. But what these differences shouldn’t do is weaken our mutual and unifying grip on essential doctrines that we all agree upon. In the spirit of that unity for which Jesus prayed, when I first discovered the work of those who penned the Reforming Catholic Confession, I immediately warmed. Certainly, a document and signatures, no matter how well-written, do not actually fix any of our disunity. But they do give us a chance, as Christians at the 500th anniversary of the most visible schism in church history, to reach our hands out to other denominations that perhaps wouldn’t even exist without the likes of Luther. I am grateful to stand on the shoulders of those who sacrificed much to crystallize the five solas. I am eager to lock arms with those who affirm our theological similarities. I am hopeful that shows of unity like this confession will foster healthier denominational relations. I am expectant that, one day, Jesus’ prayer will be answered as all His children will, in their uniqueness, diversity, and individuality, be made one as the Father, Son and Spirit are one. If you would like to learn more about the Reforming Catholic Confession or if you would consider adding your name to the list of signatories, you can check it out here. Soli Deo Gloria! Facebook gets it. Every day, I get one or more “On This Day” reminders about what I posted or did on Facebook one year, three years, or ten years ago. These reminders reveal my corny first posts (you know you had them too before you figured out your social media skills).﻿ They call my mind back to who I became friends with and how long we’ve been connected. They let me remember a photo, usually of my son, in his ridiculously adorable toddler or young child days. Just this week, I saw this picture pop up on my memories. That’s my son trying to play in the tub when he was just nearing his first birthday. He toddled over to the bath and tried to dig something out managing to get himself stuck. He was too cute to miss the perfect opportunity to snap this pic. I’m so glad I did and posted it. That was a good day. You might find this next statement odd, but it’s been true for me—these Facebook memories have helped me grow as a Christian. You see, Facebook gets what the Bible has been emphasizing for thousands of years. We have been created to remember. Moses warned the Israelites to remember God’s deliverance from the slavery of Egypt when they entered the promised land so they would continually obey him (Deuteronomy 6:10-15). Joshua commanded the Israelites to make an altar of stones from the dry river bed of the Jordan River to remind them of this same deliverance into the promised land and the parting of the river as they crossed over (Joshua 4:4-7). Jesus told his disciples to partake of the Lord’s Supper regularly to remember his sacrifice for us (Luke 22:14-21). But one of my recent favorite Scriptures calling us to remember is one short, simple verse David writes in the Psalms. I’ve gravitated to this verse because of David’s progression of emphasis: remember, meditate, ponder. He wants us to call back to mind and dwell upon God’s past care for his people and for us specifically. When was the last time you remembered when God first changed you? When did you last take the time to simply meditate on God’s goodness in your life? Can you recall when you just sat and pondered the ways God has worked around you and through you? Facebook gets it, but the Scriptures got it first. We need to remember. So the next time Facebook pops up a picture or a post that takes you down memory lane, follow it. Then let it turn you to Jesus. And remember him and his works too. binding the ideas of typed words and the beauty of a tapestry. That’s my attempt at cleverness. You may not find it inventive. You may find it annoying, or corny, or poor use of the English language. That’s OK. Even if you aren’t found of my mad word creation skills, I do want to explain why I have chosen this title. Typestry represents two images: the written word and woven art. The Bible is God’s revealed message in words to us. Have you stopped to think that God has told us everything he wants us to know about him in the words of the Bible? Language is his gift. Words are his tools. They do his bidding. And in the written pages of the Scriptures, he tells us what he is able to do by the power of his words. He created the world by simply speaking: “And God said, ‘Let there be light,’ and there was light” (Genesis 1:3). He divides language (see Genesis 11:1-9) and binds them back together (Acts 2:3-13). He rebuked, “Peace! Be still!” (Mark 4:39), and wind ceased and waves stopped. He commanded, “I say to you, rise, pick up your bed, and go home” (Mark 2:11), and weak, lame legs instantly strengthened and straightened, obeying their creator. His words surge with great power! When I consider the other image, I am taken back to a visit to the Biltmore House in Asheville, North Carolina. In the Tapestry Gallery of that grand estate hang magnificent 16th century tapestries, “The Triumph of the Seven Virtues.” These tapestries tell the tale of the three theological virtues (faith, hope, and charity) along with the four cardinal virtues (temperance, prudence, justice, and fortitude) through various allegories taken from the Bible and other sources. As I pondered those intricately designed works of art, I found myself mesmerized by the woven story they told. You might think of these displays as “Pre-computer PowerPoint for the Extremely Rich and Famous,” or “The Original Flannel Graph for Kings and Princes.” The designers of those beautiful displays saw a finished work in their mind’s eye, from beginning to end, and set about to tell history and truth through the weaving of mere fabric. As I contemplate the parallels between those majestic displays of woven artwork and God’s moment-by-moment life weaving process in the lives of his children, my mind races to Romans 8:28. The Language Giver is also the Grand Weaver (to borrow from Ravi Zacharias). He can take your worst moments and your best, your ups and your downs, your twists and your turns, weave them into a beautiful tapestry and call it your life. For those of us who follow him, he takes his Word and weaves it into, around, and through our everyday experiences to make us into a beautiful work of art, similar to those 16th century tapestries, but so much more valuable. As a pastor, professor, and writer, everything in my life revolves around studying, meditating, applying, and communicating the words of the Word. As my life meets that book, God intertwines his words with my life turning who I am into a typestry for his glory. Typestry. Language and life. The words and the walk. I like it. What about you?